Filled with fresh fruit and gourmet goodies, this classic basket combines the sweet satisfaction of fruit with rich flavors. 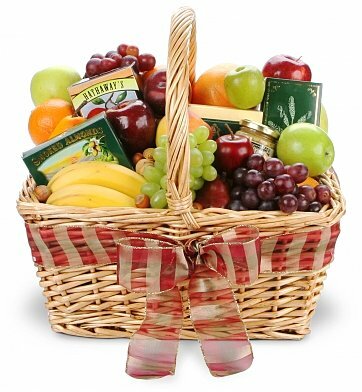 Recipients will enjoy a basket of fruit that may include apples, oranges, bananas, or grapes. The basket is then accented with gourmet snacks such as sausage, crackers, and cheeses. Each basket is a one-of-a-kind creation by an experienced, local florist. Specific items included in the basket will be chosen based on freshness and local availability. Photo shown is a representation of the final product. Specific container, fruit, and gourmet items shown will change due to florist preference. Simply Delicious Fruit & Gourmet is a hand delivered gift. These gifts are delivered by one of our local design centers located throughout the United States and Canada. Same day delivery is available for most gifts when ordered before the cutoff time. The cutoff time for Simply Delicious Fruit & Gourmet is in the recipient's time zone. The basket I choose pleased the recipients. It was indicated to me that the presentation of the basket was beautiful, the fruit appealing and fresh, the snacks tasty. This is the first time ordering through you and NOT the last. The basket went to Syracuse, NY, and I live in the Albany, NY area. Love you use local florists, especially knowing in their area, there are not many. This helps keep the little businesses alive, so "Kudos" to you. Great customer service. I requested a 3pm delivery. I received a call right after I submitted the order. I was told delivery to the area was after 5 pm. That was fine, and it was delivered on time. The family I sent it to were very happy with it. There was something for the adults and the kids. They just loved it, and said it included quality items. So glad to hear that. The price was right and I got good quality. Will definitely order again from this place. An old friend recently lost her dear Mom. Although my friend lives many miles away, we wanted to send something special that would surprise her and show how much we cared. We added some additional Items- that we thought she would enjoy. She said that the basket was "amazing" and she was very touched by this gift. Gift tree made ordering easy, and the quick delivery was very appreciated. I live in Virginia, my best friend lives in Calif. I ordered a basket for her and she was so surprised with it. They even called later in the day to ensure she had received it. She was so very pleased with the content and said she loved it all. I am very thankful for Gift Tree, it sure helps with gifts when being so far away. Thanks so much for great service and products. The receiver let me know she appreciated the basket, and it offered a wide variety of fresh fruits and snacks. She was very pleased with the thought and the gift. Arrived safely, and on time, thank you so much. My friend was delighted. My Mother in law was very pleased with her basket! Birthday gift for my father--he gave it two thumbs up! Fruit was fresh and very tasty. Would buy again. Thank you. The basket was beautiful, arrived as expected and the recipient was so surprised and delighted. I will definitely use GiftTree again and the brownie inside was delicious as well. Basket sent to a friend who just lost her Mom. She called immediately to let me know how much she loved the basket and the "comfort" foods contained therein. This basket is a HIT! Customer service was great about contacting me when the expedited option is not available. The basket was beautiful and of good quality. The recipient loved the contents of the basket and the quality of those items. I ordered it as a Get Well gift, adding a box of chocolate and 1 ballon. It was delivered on time and it had lots of different fresh fruits, at least 3 types of cheese, biscuits, crackers, chocolates and sausage. It was my first time ordering a basket, especially from Romania to NYC! I will do it again soon! She loved it and said it really made her day. Thank you so much, my friend absolutely loved it, and those were her exact words. Will definitely consider using this company in the future. The gift was a big hit. Thank you again. Great customer service. Very helpful solving my problem. I did not personally see the basket but have been getting excellent feedback from the person it was sent to. Would certainly use this site again. My boss wanted me to order a nice fruit basket for the husband of one of his colleagues and he really doesn't care for Edible Arrangements. I went online and found this website where I could order a fruit basket to be delivered the same day. Not many companies are able to do that, so I was impressed. The fruit on the picture looked great, fresh and well presented and the price was very economical. I showed it to my boss to get his approval, which is not always easy, and he approved. I don't know how the recipient enjoyed it but I do know that my boss got a very nice Thank You card the following day. I will definitely keep the company in my rolodex for future orders. Your example above was a good one......this item was delivered to three clients at a business address and everyone could not say enough wonderful things about the presentation, quality and quantity!! I would definitely use and recommend you in the future not only for my future purchases but also to friends looking for client gifts as well! Basket was arranged nicely... full of fresh fruit!! So easy and the delivery was on time. On time... good arrangement... mom was happy! I recently ordered 2 baskets. Both were very warmly received from the two different individuals. The service I got was wonderful and most professional. Many thanks to all concerned. My employee loved it! My daughter is moving into a new home in September and I will be sending her something from your your site as a surprise. You have a customer for life! The gift arrived on time and was well received! Cannot begin to write how pleased I was with this order. So was the family I sent this basket to. I will order most of my gifts from this site. From my first order to the date delivered was excellent. Thank you so much. Ordered the basket for one of our dental offices who's into healthy foods. They just loved it. The variety of fruits to choose from was great. You guys "Nailed It"! Thank you so much. The recipients of this gift basket were very pleased. They loved the variety of items. You guys did a great job! Thank you so much. Ordered this basket for my son. He received it that same afternoon! He loves the fruit especially! This basket was a gift to say thank you for the wonderful service our property maintenance staff and employees deliver on a constant basis. I am told the fruit was delicious and enjoyable. I am vey pleased to have made this purchase. I am completely impressed with this company! The selection is wonderful, website easy to use and had quick "LIVE" customer service when I had a question prior to placing my order. I placed my order at 11:00 for a same day delivery, and received a phone call from the recipient by 5:00 saying how lovely the gift basket was. Today, I received a non-automated customer service call to follow up on my satisfaction. I sent this to my aunt who is staying in a hotel out of town because her husband is ill in the hospital out of their home area. This is a great basket for any occasion. My sister in law said the basket was beautiful and the fuit was so fresh and tasted wonderful.......the other items in the basket made the appearance great and everything was so good. My brother-in-law called me and said he loved his gift basket. He went on to tell me all that was in it and all he had eaten already. I have ordered for special occasions and have never been disappointed. For the 1st time I contacted Customer Service because I received no delivery confirmation. That department was prompt, courteous and professional. I was given delivery information promptly. I felt badly even contacting them because the basket had been delivered. I should have known my order had been handled perfectly! NUTRITIOUS GIFT THAT MADE MY FAMILY SMILE! Based on the reaction of my Aunt & Uncle - the recipients in upstate NY - this combination basket of fresh fruit and delectable "gourmet items" (cheese & assorted meats) was an excellent way to express our New Year's greetings. This surprise was welcomed by my Uncle: "A wonderful gift came... < followed by elaboration about the many fruits and accessory food items >... it was really marvelous!" This arrangement was reasonably priced - but his enthusiastic acknowledgment was priceless! It was a pleasure dealing with gift tree. I was able to select specific items to replace ones that I was not interested in. The gift basket arrived on time and was beautifully presented. This was a gift and they were very well pleased. Everything was great and to their liking. The family enjoyed it all and was very humble and greatful. Thank you GiftTree for a job well done. I sent this to my brother for Christmas! He absolutely loved it! The fruit was fresh and the selection was great! The basket was delivered timely and as promised. The recipients sat on the floor and unpacked it piece by piece, enjoying every minute.